Keto, paleo, fasting, Whole30…these days it is easy to get caught up in some sort of dieting trend, but what about having actual data to back a particular dietary shift? 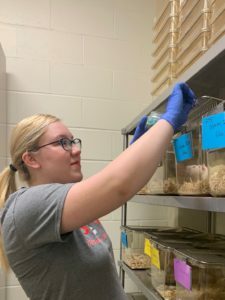 Undergraduate Research and Creative Activities (URCA) Associate, Paige Niepoetter, has been spending her time studying the impacts of fasting in rats. For three years, Niepoetter has been working with Dr. Chaya Gopalan, Associate Professor in the Departments of Applied Health and Primary Care and Health Systems. The two have been researching mental fatigue in obese rats with intermittent fasting. “Paige and I both have our areas of interest and we landed on this idea of fatigue and intermittent fasting,” stated Gopalan. “I am particularly interested in fasting,” said Niepoetter, “and I am looking for ways that people can lose weight and manage their blood glucose levels,” she continued. The study is far from over and has given rise to a multitude of other studies. “We are one of the only labs to do a study with diet-induced obesity in rats. That is a study all in itself. There are obvious trends and right now we are just starting to get the baseline details,” stated Gopalan. The research has brought Niepoetter a great amount of success. This April, she will be presenting at the welcoming ceremony for the annual Experimental Biology conference. “The conference is a really big deal with over 5,000 abstracts and over 12,000 attendees. Only 50 abstracts are selected to present at the welcoming reception and Paige’s was chosen–she’s an exceptional student and I have yet to meet another student like her” (Gopalan). Niepoetter will also be presenting at the Undergraduate Showcase Symposium on campus Apr. 25. She will graduate this spring with a Bachelor of Science in Nursing. She is interested in tackling health issues like hypertension, cardiac disease, diabetes, all of which are linked to obesity, and following her graduation she plans to apply to medical school.